When it comes to 21st century horror directors, very few have been as polarizing as Rob Zombie up until now. The general consensus with his films tends to be a love them or loathe them affair; those who enjoy his work do so for the same reason his critics hate it, and vice versa. But when a new Rob Zombie movie is announced, people pay attention and that’s all that matters. I remember when ”House of 1000 Corpses” was first announced; it was anticipated with a mixture of hype and dread. Rob Zombie’s music always had a cinematic quality and his love for all things horror and exploitation has been evident in his songs and music videos his entire career. Like me, many believed this would translate well to film. Others were more skeptical. Regardless of preconceived notions, the hype surrounding ”Corpses” was huge. However, for awhile it was looking like it would never see the light of day: Universal, who owned the rights initially, had absolutely no desire to release it due to its content being too ”immoral for their studio” and it lay collecting dust for over a year until Lionsgate picked it up. When it was released eventually, it was a critical failure, but a modest commercial success and has since gone on to develop a strong cult following throughout the years. But it did set the tone for Zombie’s divisive career in film, which remains split down the middle to this day. ”House of 1000 Corpses” is a strange movie. If there was an episode of ”Scooby Doo” where the gang stumbled into ”The Texas Chainsaw Massacre” and got brutally murdered then it would look something like this. It’s as camp and cartoonish as it is violent and deranged; another way to imagine it is as a retread of Tobe Hooper’s seminal classic – if it were directed by Oliver Stone. When I first saw ”Corpses”, I had no idea what to make of it. I wasn’t sure whether I loved it or despised it with every fiber of my being. However, it possessed a strange allure which always made me revisit it – and I now consider it to be a heavily flawed masterpiece. 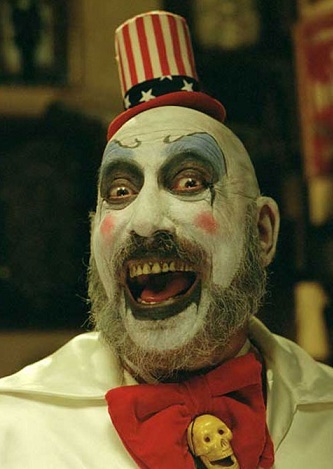 The story takes place on Halloween night, 1977, where a group of teenagers who are travelling cross country stumble upon a roadside freak show attraction run by a clown who goes by the name of Captain Spaulding (Sid Haig). It’s here they learn about a local legend who goes by the name of Doctor Satan, a mad scientist who conducted horrific experiments on mental patients nearby and, according to legend, still lives. Naturally, the foolish idiots demand to know where and Spaulding draws them a map to Dr. Satan’s supposed location. On the way, they pick up Baby Firefly (Sherri Moon Zombie), a hitchhiker on her way home who just so happens to live close-by to where they’re headed. When their car breaks down, she invites them into her home for Halloween festivities with her estranged cannibal family; this includes a living room pantomime with a musical number. Long story short: torture and terror ensues. With this being Zombie’s first film, he just threw all of his movies into a melting pot and this was the results. A 70’s grindhouse movie throwback, with a ”Texas Chainsaw Massacre” template mixed with the surreal carnivalesque nature of Todd Browning’s ”Freaks”, sprinkled with Marx Brothers and baked in surreal fluorescent imagery. Yet, despite his obvious odes and nods, this is a film only Rob Zombie could make and would set the benchmark for a style he’d go on to hone to and make grittier with his following efforts. Zombie has always favored his villains and he makes his films mean spirited, nasty and uncompromising; ”Corpses” laid the foundations and offers insight into what was to follow. 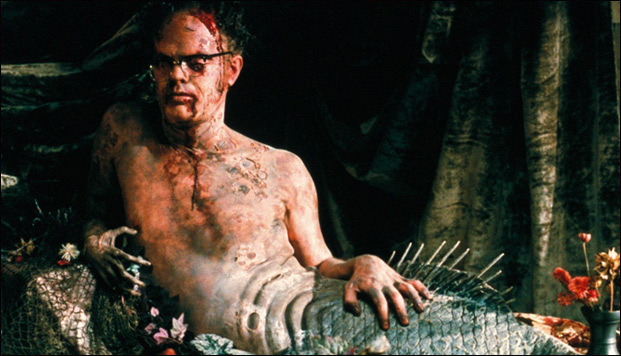 The protagonists in ”House of 1000 Corpses” are overshadowed by the murderous and quirky Firefly Family. Otis (Bill Moseley), Baby (Sherri Moon) and Mother Firefly (Karen Black) are the stars of the show, but fellow family members include the rude and crude Grampa Hugo (Dennis Fimple), the human giant Tiny (Matthew McGrory) and the imposing Rufus (Robert Allen Mukes). This is a film that not only presents its villains as strong, well written characters – it celebrates them. They’re the main attraction and Zombie dares us to root for them as they torment, torture and slaughter innocent victims, who are portrayed as arrogant douches. But did they deserve to die? Absolutely not. Was I happy when they did? Well, I enjoyed watching it happen.